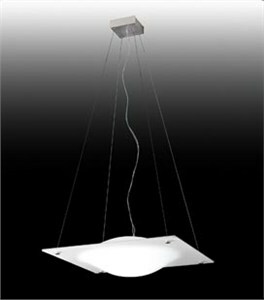 DESCRIPTION Standard pendant design in a new, sleeker version without the counterweight mechanism. CONSTRUCTION The glass diffusers sandwich a halogen light source and are suspendedd with cable to a standard junction box. The S version has two counterweights for height and angle adjustability. The suspension is available in two lenghts, see line drawings for dimensions. All metal details are in brushed nickel and the wall sconce mounts to a standard junction box.